The easiest weekend trip to the snow? 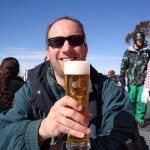 ACT blogger Mick goes skiing VIP Style atPerisher Blue. Travelling to the ski fields can be a stressful and long-winded process. From battling the traffic to fiddling with snow chains in minus five degree temperatures, a trip to the snow is sometimes seen as more trouble than it’s worth. Luckily you have a fantastic alternative. 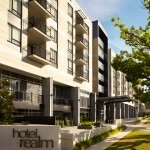 Hotel Realm in Canberra offers a ‘Ski & Stay’ package which provides two nights in an executive suite of their modern five star hotel plus coach travel to and from the ski fields (it’s wrapped up for this season but definitely add it to your list for 2012). As accommodation on the ski fields is usually priced at a premium and can be tricky to get to, the option of staying in Canberra and being shuttled to the ski fields is a great option for local and interstate Sydney visitors alike. Firstly, it has to be said that the ‘Hotel Realm’ is an impressive hotel. Apart from the exemplary service on check-in, the executive suite, with separate living and sleeping areas, is nothing short of heavenly. Situated in the parliamentary triangle, metres from Parliament House, this hotel offers exclusive accommodation and eateries within the one building. A beautiful meal was had in the attached ‘Ostani Bar & Restaurant’ before we treated ourselves to a romantic spa and sampled fruit from the complimentary selection (including bananas!) 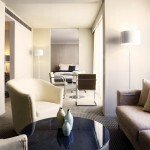 in the modern, sleek and clean suite. Despite the early departure of the coach (5.30am. *YAWN! *), the anticipation of heading to the ski-fields for the day was high, as we joined around 30 other passengers for the two and a half hour drive. Leaving Canberra in pitch darkness was a strange feeling as we tripped south along the Highway. Before we knew, it we were beholding the glorious Lake Jindabyne and pulling up to the Ski Tube for the final leg to Perisher Blue. We could not have wished for a more perfect day. Blue sky, very little wind and a top temperature of around five degrees. We picked up our ski gear that we’d pre-arranged and my partner booked herself into a first-timers ski lesson whilst I nervously hit the ‘Quad Express’, my first ski slope in five years. There is not much quite like the feeling of skimming quietly over soft fresh snow heading downwards. Of course, with my lack of recent experience, this feeling was only fleeting as I turned right on my skis only to catch a bump and go flying face first into the white stuff. This was to happen only a few times as I gradually regained my confidence (and speed) to enjoy dozens of runs down the mountain. Unfortunately the same can’t be said for everyone as my partner found that skiing was not a hobby that she would be picking up in a hurry. Although the lesson was useful, it turned out that ‘Apres’ skiing was more to her liking. 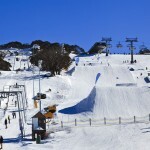 There are an array of restaurants, bars and cafe’s at Perisher Blue and we decided to grab a bite, midway up Mt. Perisher using the ‘Quad Express’ chair lift. Of course a traditional German beer washed down our meal well! I continued to enjoy the glorious winter’s day on the slopes for a couple more hours after lunch before realising that perhaps my muscles weren’t quite used to being used like this. 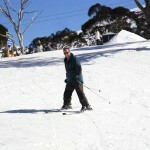 Although my body told me to stop, I enjoyed a marvellous day at Perisher. On some of the many lifts and t-bars that I used during the day I found myself chatting to various people about their weekend. One gentleman remarked that he enjoyed Perisher a lot more than the other resorts as it was more relaxed, larger and friendlier in general. He also noted that at the snow you would never see someone laugh at your misfortunate ‘turns’ or faceplants. I guess that’s something that everyone can be consoled with. We were all beginners once! The return trip to Canberra was a lot quieter as the tiredness and soreness of the bus’s passengers was evident. I fell asleep almost before the bus left Bullocks Flat (Ski Tube Station) and awoke in Cooma, halfway home. The scrumptiously soft king size bed back at the hotel was a saviour to my body that night! To complete our amazing weekend, we enjoyed a delicious buffet breakfast in the Konoba restaurant and checked out of Hotel Realm satisfied and happy, albeit a little sore for the day’s activity! There can be no better way to experience the snow than resting in a luxurious five -star hotel and be driven to and from the best snow fields in Australia in a comfy coach. Convenient for all, this is surely the best way to avoid frostbite!